Pool enclosures are a great way to enhance the aesthetic beauty of your house. 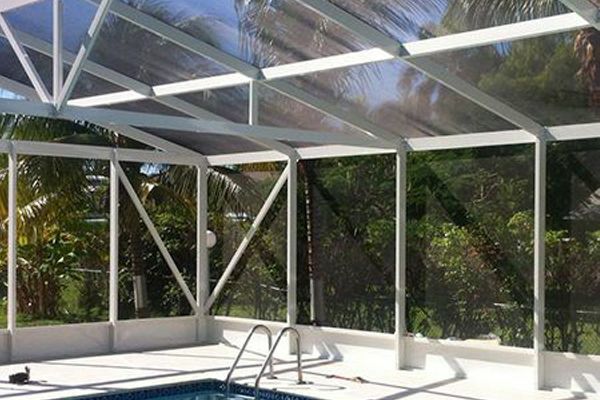 But the sun tex pool enclosure installation in Grand Cayman house also allows you to enjoy the cozy climate by keeping away the scorching heat of sun. It blocks almost 80-90% of sun’s rays, allowing you to enjoy the sunshine in a refreshing way. At Ishmeal Shutters, we buy the highest quality materials to provide you with a finished product that will compliment your home and match your personal taste. Every enclosure is built with quality and years of experience. We also construct custom designed pool enclosure, which is almost maintenance free and safeguards the pool area from unwanted elements like debris and insects, that so often ruin your outdoor fun.